Kelly Plowe, MS, RD, CSSD is a nutritionist and food and health communications specialist. As a registered dietitian and certified Sports Dietitian, Kelly helps consumers put health and nutrition research into practice. She believes diet is at the center of a healthy and fulfilling life and is dedicated to helping others be their best. Kelly lives in sunny Santa Monica, California with her husband and their bulldog, Sunny. She is a runner and recently took up Lagree pilates. Living in SoCal, Kelly spends most of her free time cooking, trying new restaurants and attending music concerts. Follow Kelly on Instagram. Smoothies. They're what's for breakfast, lunch and dinner. These blended drinks cater to our busy, nonstop, on-the-go lifestyles, making them an easy addition to our diets. In SoCal, smoothie shops are like Starbucks -- there's one on every corner. But the booming blender-and-protein-powder market, along with the whole-foods/clean-eating movement, has made it easier (and more tempting) to get on board with this trend. Perhaps you're a smoothie veteran and have your go-to blend, but you're looking to switch it up. Or maybe you're still feeling your way behind a Vitamix. Whatever the case, we've created three smoothie templates -- Sweet, Green and Protein -- that you can customize to cater to your likes or to use up some extra fruits and veggies you might have on hand in the kitchen. 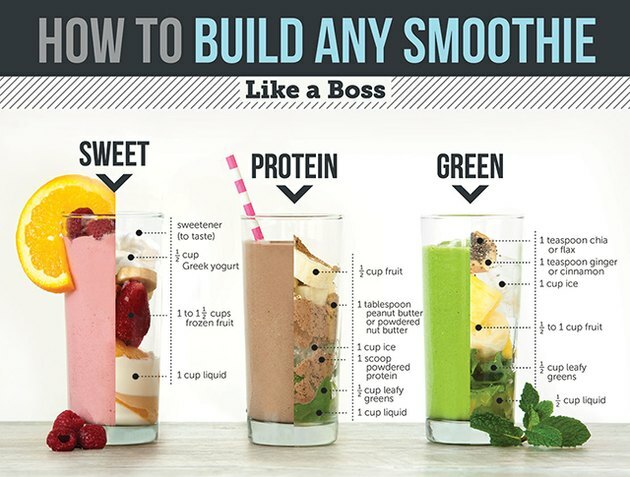 Think of them as guides or smoothie "how-tos" so that you can build any smoothie like a boss. Add a little sweet to your smoothie, whether it's to curb that sweet tooth or to balance out some of the bitterness from leafy greens or other ingredients. The fruit you use will play a big part in the flavor of your smoothie. Using frozen fruit instead of fresh is an easy way to add instant thickness to your smoothie. The amount of liquid you use will help to determine how thick your smoothie will be. The protein-powder category has exploded in the past few years. There's an option for almost every type of diet or lifestyle and a wide range of flavors too. Most of us fall short on our daily vegetable intake. Smoothies are an easy (and tasty) way to sneak in some leafy greens. Add a creamier, thicker consistency to your blend along with a boost of nutrition with these options. Kelly Plowe, MS, RD, CSSD is a nutritionist and food and health communications specialist. As a registered dietitian and certified Sports Dietitian, Kelly helps consumers put health and nutrition research into practice. Kelly spends most of her free time cooking, trying new restaurants and attending music concerts. Follow her on Instagram.